Robyn McKay + I are at it again! 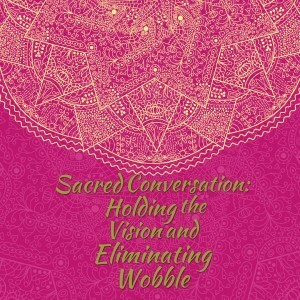 We’ve just held another one of our super potent SACRED CONVERSATIONS, this time one how to hold to one’s vision of what we want to create in the face of self-doubts, what-if’s and that blasted wobbliness! This call is designed to help you to REALLY BELIEVE that what you desire is actually available, in spite of everything that shows up to try to prove the opposite. Whew! It’s been a really rough couple of months… for ALL of us! Chances are, like Robyn and me, you have been confronted time and again with challenges to your vision. We’ve been getting feedback that it’s really hard to hold onto the vision of what you desire in the face of these challenges. We decided to revive our series of sacred conversations to address this, because RIGHT NOW is THE moment in history par excellence to set yourself up for living your dreams. In this man’s world, we’re told how we “should” live. What size box you’re allowed to live in. What’s possible given the limitations we were born into. Guess what? That’s all a load of BS. It’s not about who has the biggest, fanciest box. The important thing is to realize that there IS no box, except one of our own creation. So come listen to this call. We tell stories, we meander. And yet, in our non-linearity we always get to the crux of the issue. The live call is now over but we invite you to join the replay, where all of the magick is still available. Register below for this free call. Robyn + I cannot wait to deepen into this important topic with you.